We all met at JFK around 8:00; mom and Pat arrived via dad''s drop off and I came from a shuttle in the city. I first commented that they matched in their all black attire only to later to find out that they met up also wearing the same scarf a few hours earlier! We waited in a decent line but then had the most lovely check-in attendant you could have ever hoped for! She looked through our itinerary and wrote us recommendations of wine and restaurants in both cities! After some dinner and beers, we are now waiting at the gate for our 11:55 departure. We arrive about 3:00 pm on Wednesday afternoon and Dan arrives the following day. We can't wait for our next adventure to begin and are excited to share another journey with all of you! We had an uneventful flight; had dinner, fell asleep watching movies and all got about 4 or 5 hours of sleep. Then woke up, had some breakfast and we were in Istanbul before we knew it. The night flight really was the way to go! We got our visas ($25 for us and $60 for Pat from Canada! ), went through customs, got necessities at Duty Free, aka 6 bottles of wine, and then headed to grab our bags. Little did we know that this process would suddenly end our smooth travels. As the bags rounded the turnstyle and slowly no more bags were coming out, mom's was nowhere to be found. Although Turkish Airlines is supposed to be one of the best, the man we dealt with at the luggage counter should not be included in that rating. He was unhelpful, his Enligsh was weak and frankly pretty rude to mom. We left without the bag in hopes that our hotel could help settle the situation and track down her bag. We met our pre-arranged driver and had an easy commute into the city to our hotel. The hotel is fantastic; clean & modern with polite and helpful staff and free internet in the business center where I am currently sharing this information with you! I am getting scarce wifi in my room where I can use iMessage and What's App but can't access internet and am unable to upload pictures at this time. We'll see if I can remedy this at a later date. We walked around the neighborhood last night and down towards the Blue Mosque area. The streets were lined with people hawking every kind of fake item imaginable and even some dancing dolls doing gangham stlye which my students would love. There was a cute little street with lots of tables and strung lights and lanterns that we chose for dinner. We sat next to a nice French woman who was actually the sister-in-law of our waiter. The food was delicious and our waiter was delightful; Pat took a picture with him which I hope to share. The men here seem to be big flirts and the owner of the restaurant already asked mom for my hand in marriage...sorry Andy! After dinner mom had some Turkish ice cream, walnut and some other kind of nut flavored and said it was delish. All in all it was a great first night! Let's hope tomorrow brings Dan here safely and also mom's suitcase! We do not need a repeat of China. We headed off this morning to meet up with a contact given by one of mom's patients, Bruce. He gave us the name of a man who owns one of the shops in the Grand Bazaar so we sought out to find him. Finding a specific shop in the Bazaar is no easy task, with thousands of shops down hundreds of alleyways and hallways it was quite an adventure in itself. Paul was the most lovely and gracious person we could've met. He welcomed us into his shop, gave us Turkish tea and wrote out many recommendations for restaurants and places to visit outside of our guided tours. Not only was he helpful but he also had a gorgeous display of antique jewelry! Mom found quite the treasure and it is so stunning. After chatting with Paul for over an hour and a half, we walked around some of the other shops. The first stop was a bathroom outside one of the exits. You had to pay 1 Turkish lira but it was well worth it for the cleanlisness and nice sink to wash in afterwards. Mom and Pat got western toilets and I lucked out with the floor version, but thankfully I am well trained. Before we left, a friend told me that there are fantastic knock offs here that are all made with real leather and are some of the best she has seen. We picked up some of those as well and are still considering a stop back! We left the bazaar as a slight rainfall was beginning so we headed the short walk back to our hotel. Mom's suitcase was found and waiting for us at the front desk! Thank goodness she doesn't have to replace everything at the "Dior outlet" which dad wondered. P.S. dad, when has mom ever worn Dior? Anyways, shortly after we came back to the hotel DAN ARRIVED! Unlike China, we will now officially be on this journey with him rather than him heading back to the states as we begin the tour. They sell a lot of things here on the street but men keep hawking jeans to me. Do they not like my pants? Sell me some bags or something I'd actually buy. One guy even asked mom is she wanted to buy jeans but then pointed to me, asking if she wanted to buy jeans for me. Come on, people...I have jeans and don't need your bedazzled ones. After Dan arrived and settled in we headed out to the Spice market area. Dan loaded a walking directions map on his phone that he can access without the internet and it has already come in handy. 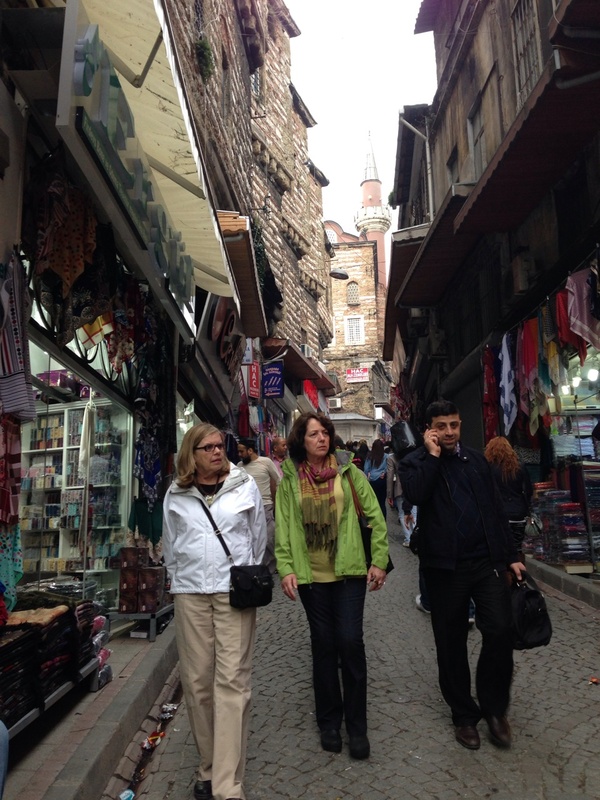 We headed beyond the entrance to the Grand Bazaar we went in earlier and down a side street filled with stalls. Yesterday was their Saturday here and the streets were buzzing with locals and tourists alike. The stalls are arranged by types of items so I wonder how the competition works or which place you know is better when there are 50 stalls in a row selling the same scarfs, dishware, formal dresses, bedding, etc. We finally made it to the spice bazaar or the spicy bazaar as Paul called it and wandered around smelling all the wonderful things. We went to the restaurant he suggested and that I also found in Carmela's book at the far end of the market. Paul had recommended it not only for the delicious food but also for the clean ladies washrooms, and boy was he right! They had Western toilets and everything was sparkling. There was stone wallpaper that looked like real stone and fooled Dan and Pat, but mom and I spotted it! Dan had a huge lamb shank, I had lamb kebabs and mom and Pat had sea bass cooked in parchment paper. Everyone's food was amazing and we have also been enjoying their local beer called Etes. I wonder if we can get it in the city because it's light and refreshing. We headed back through the bazaar, picked up some souvenirs, Dan heckled with a baklava salesman and then we took a different route back. The Etes (Turkish Beer) and washrooms were so enjoyable at the restaurant until I had to go again shortly after. The miles of stalls and no bathrooms in sight is my idea of a horrible nightmare. I knew I couldn't make it back to the hotel and Dan spotted a WC neon flashing sign just as I couldn't walk any further. The stalls were closing shortly so this bathroom looked like it had just been, literally, hosed down. It was clean but also the creepiest place I had been in quite some time. When I looked up I saw disco lights and fake ivy plants hanging from the ceiling. We had some beers in the lobby and listened the the live clarinet and piano player, rockin' Saturday night here! Then headed to bed. Mom and I were both unknowingly up from about midnight until 3am in separate rooms. The jet lag hit a day late and the sleeping meds were in her room. Today was our only guided day in Istanbul and it was jam packed with the highlights package from our tour company. We began the day at a cisterne then went to Haghia Sophia, Topkapi Palace and ended the day at the Blue Mosque. It started pouring rain after we finished lunch at Topaki Palace and it was miserable....pouring and cold. We still had the Blue Mosque left to visit but at that point everyone's mood wasn't great. I had my rain coat, rain boots and umbrella so I was the least cranky of the grumps but frankly it was not fun to be cold and wet for several hours. I'm glad we went to the Blue Mosque with our guide because he gave us a lot of information we wouldn't have received otherwise but I hope to go back again before we leave and enjoy it more in a more warm and dry climate. Our day ended back at the hotel warming up and thawing out in the hot tub and steam rooms downstairs. They also have their own Turkish bath in the hotel. We saw and learned so much today that it's difficult to recount all the details. It was A LOT of info to take in in one day but I'm so glad we had a guide or I would've only internalized a fraction of what he told us. Today we had a very busy day! We started out by going to the Dolmabahce Palace which was the palace that was completed in 1856 and then used instead of Topkapi Palace. We took the tram from outside our hotel to the last stop on the other side of the water, not the Asian side, but we will attempt to visit there before we leave. The sultan who built Dolmabahce wanted to create an updated and European inspired palace as opposed to the traditional one they had used for over 400 years. It is said to rival Versailles in its style and beauty and it does, while containing the world's largest chandelier at over 9,000 pounds and 750 lightbulbs. Sadly, that chandelier was not turned on for our tour but we did see several other oppulent ones throughout the palace. Pictures were not allowed inside as you can see from the many photos taken outside and we also had to wear plastic covers to our shoes to not damage the carpets. The "tour guides" did not share much more information than I learned in my books but were mandatory to lead you through both parts of the palace. We first went to the harem, or the family and concubine quarters, and then to the main halls and receptions rooms of the palace. Fun fact, Ataturk, who Westernized the country and became its first president in 1923 resided in the palace until his death in 1938 at 9:05 am. I read that all the clocks in the palace are set to his time of death but I didn't see any so maybe that's just something they write in the books? The only clock I did see was the clock tower which is supposed to "keep real time" but in reality was 45 minutes off. After the palace we headed up to their version of SoHo or so our tour guide yesterday said it was called. There is one long main road mostly free of cars and vehicles aside from the trolley and has hundreds of shops, bars, cafes, and anything else you could imagine. Down every side street there were even more! We spent all afternoon and into the evening wandering these streets and enjoying all the sights. We found a restaurant in the top 10 book that was near the area and it turned out to be our best meal yet. Affordable, local and delicious. Beer is typically the first thing we ask if they serve when looking for a restaurant and have walked away from many just because they don't. 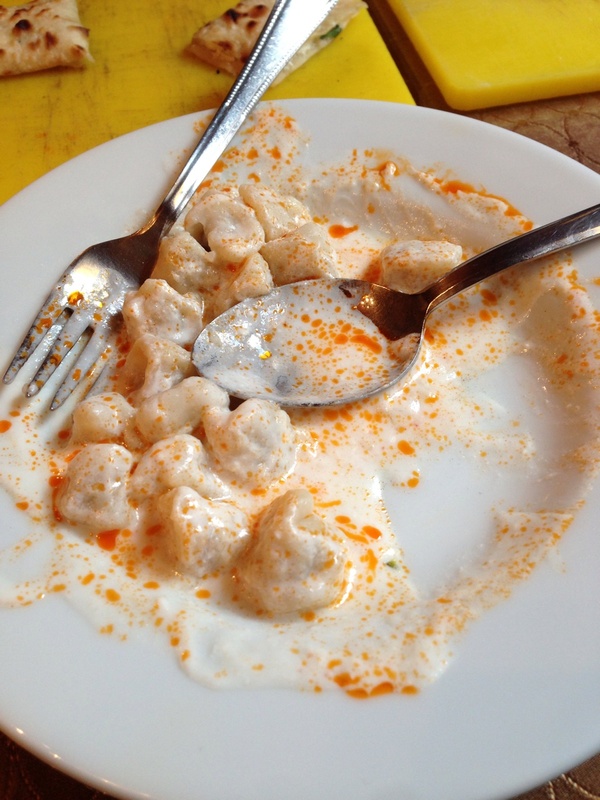 We had manti, which is a turkish pasta similar to gnocchi filled with meat or spinach and it was amazing. We also had soup and flat bread with cheese and spinach. Definite must go, if you come to Istanbul! We walked some more to find the jazz club we had read about but they didn't go on until 10:30 and charged 40 Turkish Lira at the door. Instead we found a bar nearby, had some drinks and then headed back to the hotel. Our self guided day was better than expected and full of lots of surprises around literally the thousands of corners we passed! Mom and Pat got up early and headed to mass for Palm Sunday in the "new city". We met up with them around 11:30 at the end of the tram line by the palace we went to yesterday. We then got on one of the many boats that offer river cruises along the Bosphorus. The cruise was about an hour and a half and we saw some fascinating palaces, mosques and beautiful waterfront homes. On the way up the river it was sunny and warm and Dan and I sat on the top while mom and Pat opted for the benches underneath. On the way back down the river it turned very cold and we bundled up. After the cruise we took the tram back to the old city near the Blue Mosque. We stopped for lunch and had some donar, which were underwhelming, and some beers. We walked around the mosque area and enjoyed its beauty that we could not a few days ago because of the rain and cold. The parks were bustling, the sun was shining and they're tulips everywhere! We headed back to the hotel for a bit and rested up. We followed a recommendation of a friend of a friend from Turkey and headed to a favorite restaurant of locals in Beyoglu called Yakup 2. We had a delicious selection of mezes, or small plates, and all had excellent meat dishes for dinner. Overall, it was our favorite meal yet! After dinner we found a cute, small street with tables outside that reminded me of Stone Street. Under the heat lamps it was very pleasent to sit outside and enjoy a drink while people watching. Dan has been out a few nights but this was our first late night for dinner and drinks and it seems that around every corner in Istanbul there is something new to explore and discover. We woke up early this morning, had breakfast at the inn and then Bulent took us to the airport. It was sad to say goodbye but hopefully we will see him again sometime. He certainly was the best guide we have had on any trip...ever! If you know anyone who is headed to Turkey, I will definitely pass along his contact information! We had a short one hour, uneventful flight back to Istanbul. We are staying at a hotel connected to the airport today as we leave tomorrow and wanted to make an easy transition with luggage. The hotel has the longest hallways I have ever seen, it looks like a cruise ship! Aside from that, the rooms are very large and roomy and will do for our last night! We dropped our stuff, lounged for about an hour and then got ready to head back into the city for one last time! We knew we wanted get baklava from a place that had been highly recommended by many and also visit a tower in the new city that we had been putting off. We hopped in a cab and sat in A LOT of traffic before arriving in the new city. It was great to drive along the water again and get a different view of Topkapi and other sights we had visited earlier in the trip. The driver dropped us off right outside Karaköy Güllüoğlu, the local's favorite baklava. We chose some for gifts to bring home and of course, had to try some for ourselves. It was delicious but so sweet! And that is coming from someone who is a connoisseur of candy and all things sugar. After we were full from Turkish coffee and baklava we headed up in a tram type contraption that was underground. It's something like the oldest cable car or...something along those lines? Whatever it is known for though, it saved us a long schlep up some very steep streets!! Did I mention it's cold today? Because it was! We had to wait in line for a while for the tower and it was not very pleasant. Good thing the views from the top made it all worth while! You can walk all the way around the outside of the top of the tower to get 360 degree views of Istanbul. I highly recommend doing this near the end of your trip because we were able to locate places we had visited and we were able to make so many more connections than we would have been able to earlier in the week. It was a perfect last day activity! We were so cold afterwards that we headed back to our favorite restaurant from earlier in the week and we had several mezes and I ordered the lamb again! The heat seemed to be acting up this time so the dinner wasn't as enjoyable as the last time. After dinner we went to a few bars before heading back to the hotel. Dan was meeting up with some friends and came back later. Our cab driver was fantastic and described how his daughter who works for Turkish Airlines speaks 5 languages! It was very impressive to hear his story. Off to bed now, we fly back to the states tomorrow and Dan heads back to Saudi. It was a trip for the books...and the blog :) Thanks for following!